Description: This butterfly is widespread throughout Asia. It has such a broad range because the young caterpillars are able to eat such a wide range of plants. There are over 100 species that this caterpillar can eat, making it quite polyphagous. The females and males look slightly different. 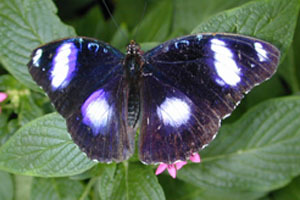 The males have four large purple spots on their uppersides, while the females have a large white band and a few white dots. They love our fruit and flowers and are quite calm.